Dhimmitude is alive and well in the United States. One has to wonder if this practice now endorsed by the AAP will bring the weak sister feminist out in protest? Be prepared to be outraged. entire purpose is to deny women sexual pleasure..."
And it goes onto say, "...The supposedly intelligent physicians in the AAP are endorsing a policy for a brutal, sexist, non-medical procedure that is universally condemned. 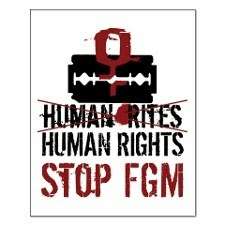 Their own 1998 statement recognized FGM as a human rights violation, and they opposed "perpetuating a social practice with cultural implications for the status of women." Today, however, AAP members are more enlightened; they no longer use the acronym, FGM, choosing instead to recommend "female genital cutting (FGC) or ritual genital cutting." These terms are meant to be "neutral" and "descriptive" rather than culturally insensitive. Ironically, they oppose only those forms of FGM which "pose the risk of physical or psychological harm" -- as if ritual "nicks" have no such risks. One writer described the "harm reduction" as similar to "the difference between amputation and laceration..."
I wonder how the great appeaser Obama would feel about this practice, or the First Ladies view of this inhumane practice, and that it happens quietly in America to young defenseless little girls. If you will recall he was supportive of his 'babies (daughters having abortions). Will the Department of State add this to the list of violations of Human Rights in their report to the UN? This site has more graphic details, and you should go and see it so that you will be appropriately offended. We have clearly lost our moral compass. Any doctor that engages in this practice should lose his license. Will this provedure be covered in the Healthcare Bill? Our nation has allowed a group of Doctors to engage in and support an ammoral barbaric practice. Misogyny is an ugly chauvist practice. That the American Academy of Peadiatrics should not endorse such an abominaable practice on young girls. This is a real moral outrage. Where is NOW on this issue. And how is it that this happened under the radar? Who are the monsters that supported this outrage? How is it that these monsters still have a license to practice medicine in this nation? what is going on at State Medical Boards and Licensing? To say I am outraged is a gross understatment. ..."Today the AAP issued a statement saying it had "retired" its statement and saying it opposes FGC and doesn't endorse the "clitoral nick." The group's president, Judith Palfrey, said the policy was retracted "because it is important that the world health community understands the AAP is totally opposed to all forms of female genital cutting, both here in the U.S. and anywhere else in the world." As for the outrage from NOW and self proclaimed, women's advocate progressive politicians and journalists...... waiting, waiting.... .crickets...... Hillary, Gloria, Maureen... hello, hello... anyone there........ I thought so.